On July 23, 1997, blackjack dealer Mark Blackburn was found dead in an empty Arizona desert from injuries stemming from an apparent explosives accident. Police left his 1980 Datsun B310 at the scene, and now, 21 years later, Mark’s son, Michael, and his daughter, Lalani, are on a quest to find and recover the car. With the help of one Facebook group for mechanics, the two might just pull it off. Hop onto Facebook’s The Wrenching Network—a 26,500-member strong group of professional technicians—and you’ll find wrenchers from all around the country helping and following the progress of one of the group’s members, Michael Blackburn, as he tries recovering his late father’s old Datsun from a remote part of the Mojave Desert. The exact coordinates of the abandoned Datsun. I spoke with Michael—who operates his own home-based car repair business in Wisconsin—over the phone, and he told me the whole story from the top, beginning by describing how he had lost all contact with his father at a young age. Michael and his sister, Lalani, were taken away from their parents when he was three and his sister was six. Both spent about four years in two different orphanages prior to Michael going to a foster home. That’s when he, at age 10, was separated from his 13 year-old sister, and cut all contact with his biological family—allegedly per the demands of his foster family. “In early 1998, I was informed by my adopted mother that back in July of ’97... my biological father had died,” he told me. “At the time, I didn’t know about a car, I didn’t know how he died, I didn’t know anything about it other than what my adopted mother had chosen to share with me,” he continued. The following year, 1999, Michael left to San Diego for college, leaving after a year to Utah, where he began searching for his birth family in earnest. While there, he says he collected basic information on his parents and sister from his adoption file. Then, in 2003, while living in Illinois, he put that info to use when his friend suggested trying out an online private investigation tool called PeopleSearch.org. “I went out to visit [my sister] in 2003,” he told me. That’s when, according to his sister Lalani, she mentioned the Datsun. “Ever since he got back into contact with me,” she told me, “I’ve always told him, you know, dad’s car is still out there.” But Michael doesn’t recall learning about the car in 2003; he told me that it wasn’t until many years later that the wagon even entered his mind. “Lt. Janssen, deputy Hodges, Range Burt and myself arrived at the scene,” Lt. McNally—the officer assigned to the case—writes in the report provided by Michael Blackburn. “I observed a white 1980 Datsun B310 station wagon bearing Nevada registration 128-CNL. A NV.M.V.D Records check showed the vehicle belong to Mark Blackburn,” the report continues. McNally notes in the report that he found a “car battery jumping device,” which was hooked up to an electrical cord, the end of which “showed signs of being involved in an explosion.” The officer also mentions that there were pieces of metal pipe, a nine-volt battery and bell wire found near the body. The reports concludes, saying “It was apparent that the subject had been the victim of an accidental explosion of a home made device.” Michael told me over the phone he thinks his dad was likely using the explosive for landscaping. “What they think happened is, he was trying to clear some trees with like, a homemade explosive device, and it went off accidentally,” he said over the phone. Michael’s sister, Lalani, told me something similar. “My dad was always one of those do-it-yourself kind of people, and like, would never hire anybody to do anything,” she said over the phone. “He apparently found some concoction for explosives online, and so he was out there supposedly clearing the land to build the house on.” That’s when the explosive—a pipe with powder from 12-gauge shotgun shells—apparently exploded as her father screwed on the detonator cap. Lalani, who at 19 went to Kingman to “claim” her father after his death, says officers told her at that time that she could go out and get the car, and that she just needed a four-wheel drive. Lalani told me that she’s still not sure why police left the vehicle out there. “The Sheriff’s department just decided that it was gonna be, I guess, too difficult to get the car from where it was,” she thought out loud. The car has been sitting at that spot ever since—for 21 years. Image provided by Michael Blackburn. From the Mojave County Sheriff’s Office. But Michael didn’t read the police report back in 1997. It wasn’t until years later, well after he’d reunited with his biological family through the online investigator in 2003, that he began digging deep into the details of his father’s death, and eventually became suspicious that the Datsun B310 might still be in the desert. Michael tells me that, around 2011 or 2012, he got in touch with the Mojave County Sheriff’s Office to figure out exactly where Michael’s father’s body had been found 15 years prior. Michael and his wife planned to visit the site on a road trip to pay their respects to Michael’s father, but the couple didn’t have enough information to figure out where to go. That’s when the sheriff’s office sent Michael the map above and the aforementioned police report, which mentioned that the car was left in place. Michael began wondering if his dad’s car was possibly still there. He and his wife rented a Ford Explorer (shown below), and after speaking with park rangers, they began their journey into the desert. Sadly, Michael and and his wife got caught in a wash and turned back, telling themselves they’d eventually return and try again. Six years have passed, but Michael has still not been able to make it to the site of his father’s death. 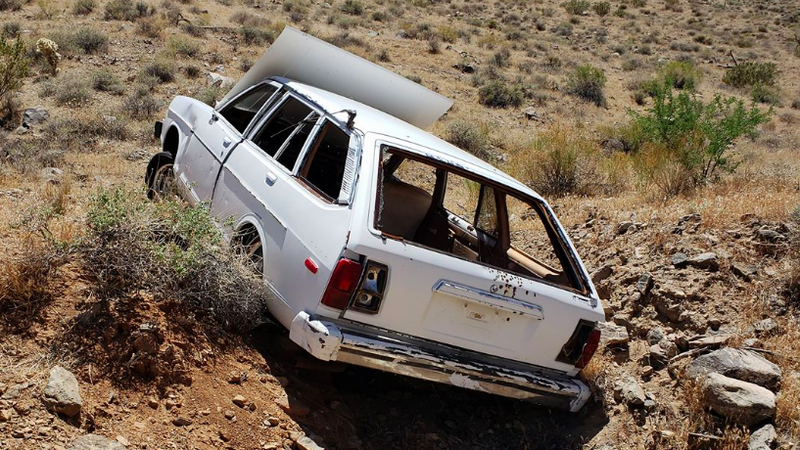 In the years since—and especially after spotting the car on Google maps in 2013—Michael has been talking quite a bit about his late father’s Datsun 310 wagon, which has been left abandoned for two decades in the unforgiving Mojave Desert sun. But George was just one of the many The Wrenching Network members to help out. Chris Walker, an Ohio mechanic of 15 years, for example, started a GoFundMe page to help finance the extraction effort. Walker told me over Facebook that, as someone who plans to fix his grandpa’s Chevy S10 with his son, he understood what a car can mean to someone. Another member of the group, Zachary Green from Washington, actually went out to find the car, but came up just short. Green goes on to say that he and his wife had to drive 23 miles on a flat right rear tire just to get cell service for roadside assistance, and adds that he and his wife decided it made sense to just limp their vehicle back. “We came close, and it just wasn’t enough,” he says, before apologizing to Michael. But Zach’s attempt wasn’t the last. A Kansan living in Mesa, Arizona, Austin Toy was the very first from the group to make it to the Datsun, posting up-close photos of the abandoned car onto Facebook. There the car sat, with its rear suspension buried deep in the sand, and some bends in the cowl area. But overall, Austin admits, the car was in decent shape. Photos of his late father’s long-lost Datsun, naturally, brought Michael Blackburn great joy—joy that he communicated in a video on The Wrenching Network’s Facebook page, thanking Austin for his help, clapping, jumping, and just showing what looks like genuine excitement. But Austin’s trip was just a reconnaissance mission; extracting the vehicle, which was buried deep in sand, has been a whole other matter entirely. Luckily, the owner of an off-road recovery company caught wind of this story and stepped in to help. That owner’s name is David Nehrbass, who—in addition to operating an off-road fire, rescue, medical and recovery service called Motorsports Safety Solutions—is also a law enforcement dispatcher for the National Park Service at Lake Mead, not far from where Mark Blackburn died in 1997. Nehrbass came across the GoFundMe link of Facebook, and, upon reading it, began asking around his office to see if anyone knew about the Datsun. Nobody did. “I was shocked that I had never heard anything about this, because the first officers that had responded to the accident... were actually from our agency,” Nehrbass told me. “We pulled it out today,” Nehrbass told me over the phone on Tuesday, saying that, after seeing the car teetering on a little cliff, he decided to winch the car to turn it about 75 degrees, and then pull the car off the ledge and about a mile onto flat land. “We’ll go back with a trailer and get it to civilization next week,” he said. The video above shows Nehrbass’s special recovery truck, a Ford F-350, yanking the Datsun from its precarious perch. Nehrbass, who traveled about 50 miles off-road to get to the car, described just how remote this location was. “Not only do you need an off-road vehicle,” he told me, “but the area that [the car is] in is very, very unlikely to be traveled soon,” going on to say that the newest beer bottles he saw littered on the desert floor were likely from the 1990s. The car’s interior was trashed, and the vehicle definitely now needs a “ground up” restoration, but the panels were there, and the car was able to be towed, though the rotten tires started shredding. Nehrbass told me he’s going to take a set of wheels and tires out to the site on June 4th, flat-tow the Datsun to a place about a mile away where the car can be pulled onto a trailer, and then tow the wagon to Las Vegas. The plan for what happens to the car once it’s in Las Vegas is still shaping up, with members of The Wrenching Network organizing a “relay” tow across the country. Lonny Burgess, a tinkerer living in Las Vegas, is taking point at organizing the Datsun’s journey to Hartford, Wisconsin. He told me over messenger that he met Michael through the Facebook page, and that the story has got everyone pumped. “Everybody in the group is excited and amazed that its finally going home,” Burgess told me. Burgess is in the process of determining who will tow the Datsun during which legs of the roughly 1,800 mile journey. After his death and cremation, Mark’s possessions were placed into the brown plastic box that once held his ashes. Among those possessions, which his son Michael is now holding onto, is a driver’s license, gaming commission card and the key to the Datsun. “He deserved better than the ending that he got in this world. He deserved so much better,” he continued. Lalani plans to drive from Pennsylvania to her brother in Wisconsin, so they can both travel to to Las Vegas and help tow their father’s long-lost Datsun to Michael’s house. The plan for after Michael finally has the Datsun? “I gotta start finding parts and restoring it,” he told me.